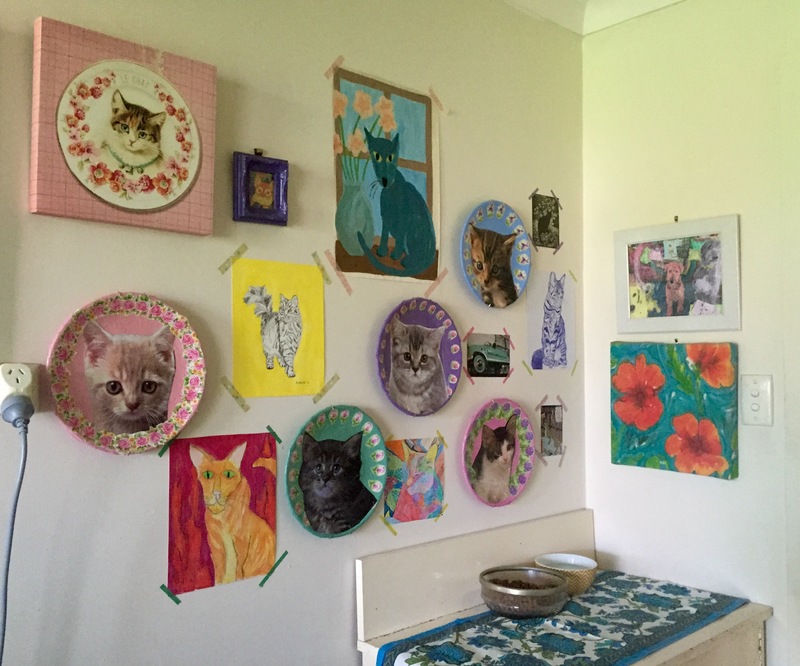 I have a bit of a “thing” for kitsch cat stuff. 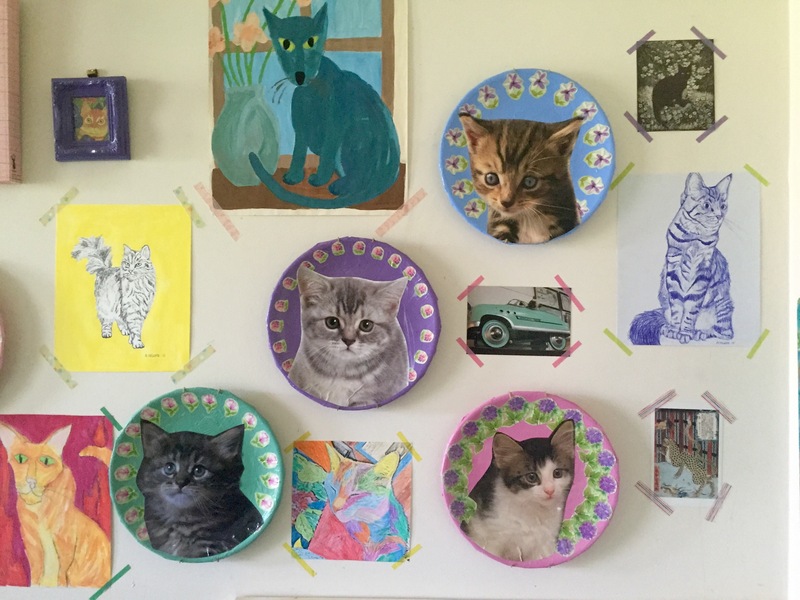 Yes, I know I’m sort of cementing my crazy cat lady status here, but I do tend to be drawn to it. 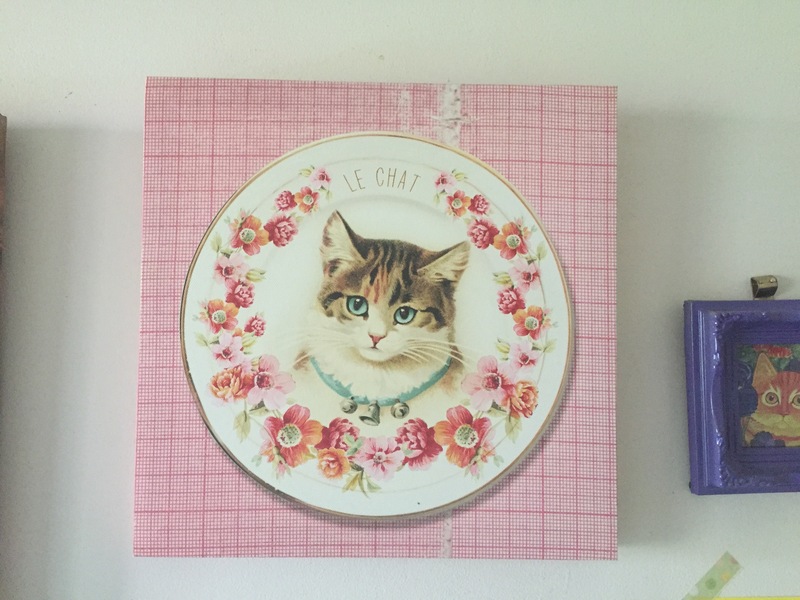 When I saw this canvas in Typo, I had to have it and it has hung in my laundry, where my cats eat ever since. 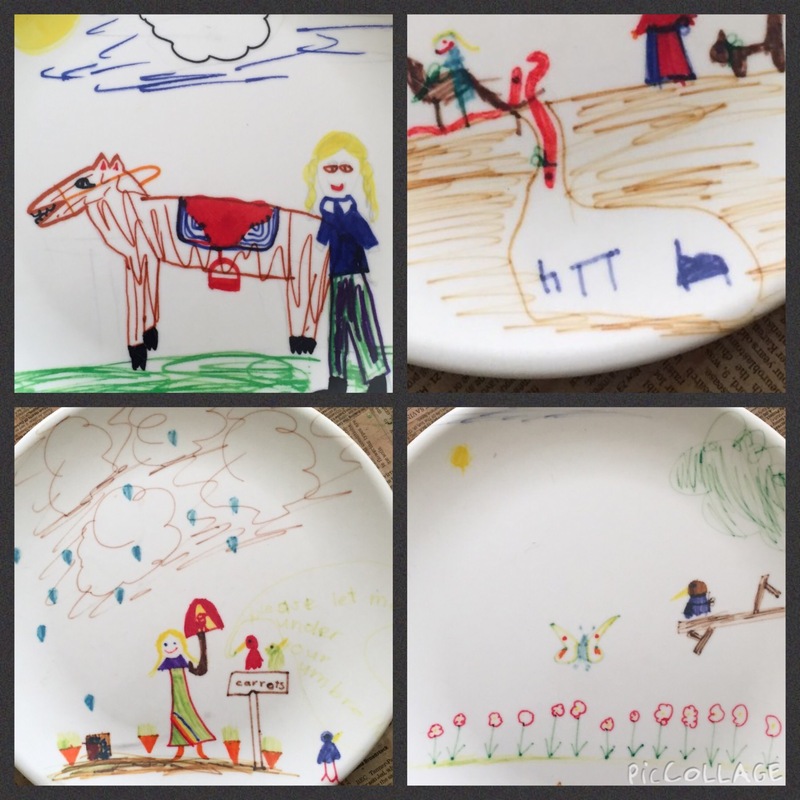 Then I was digging through a box of stuff in the shed and came across these ancient melamine plates that I had decorated as a child. A bit of history, but what do you do with something like this? I wasn’t ever going to use them, and no-one else would want them. 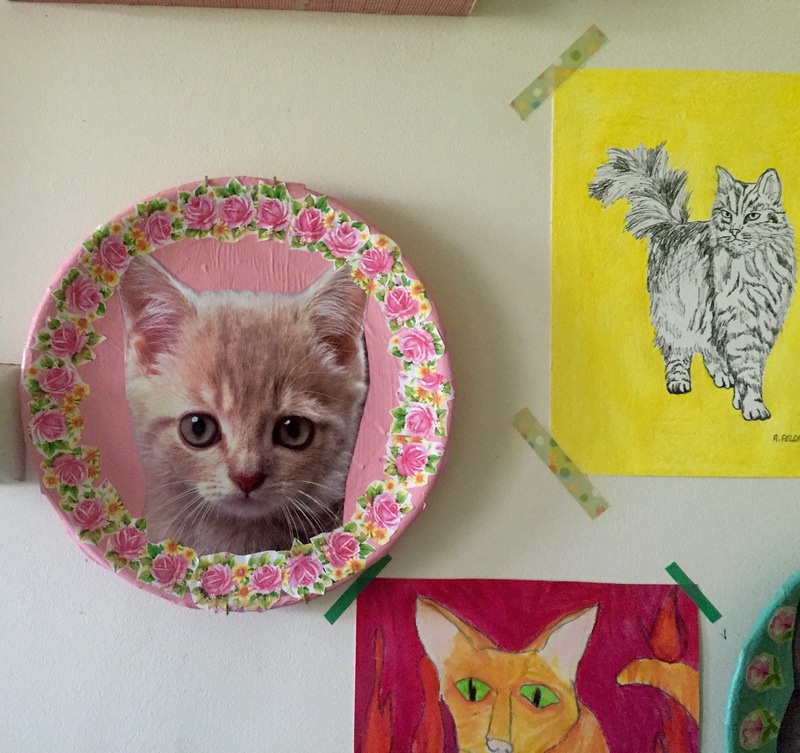 So I decided to photograph them for posterity, then upcycle them with a bit of decoupage. 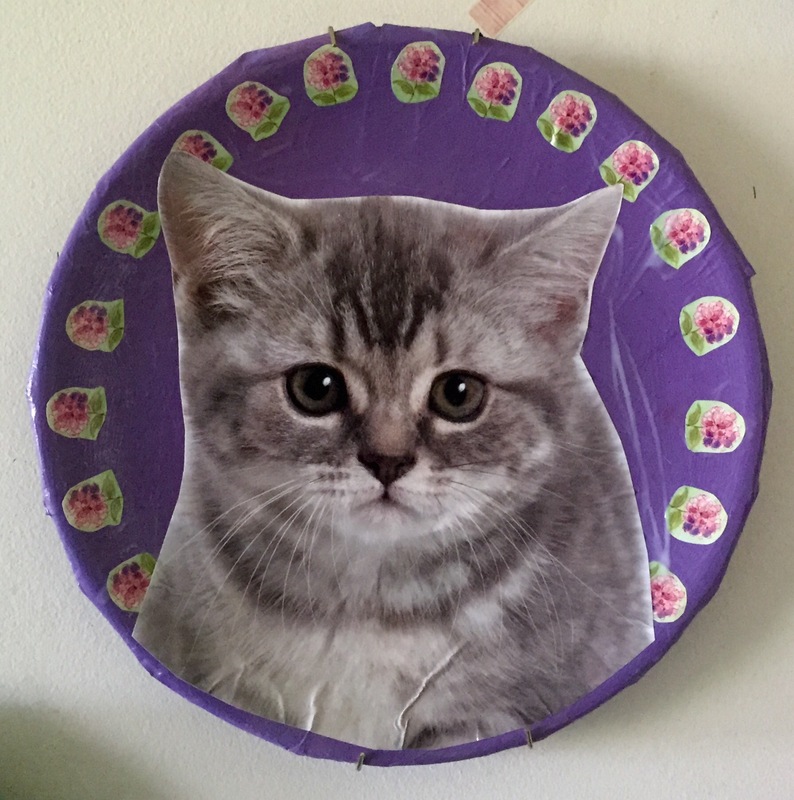 And what better inspiration than kitsch kitty plates? 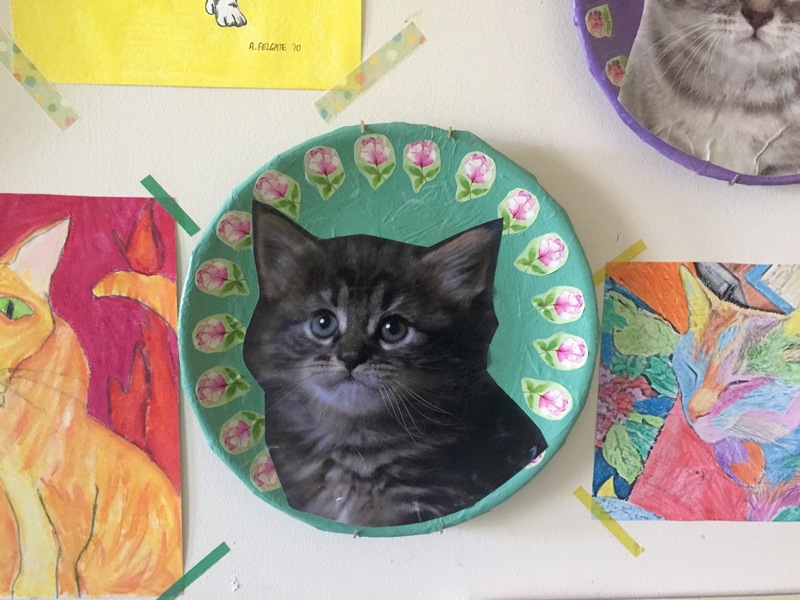 I knew I had an old kitten calendar that would be perfect, and I raided my stash for all the other bits and pieces I needed – newspaper, mod podge, acrylic paint and some flowery wrapping paper. Firstly I did a papier-mâché layer with squares of newspaper and mod podge. 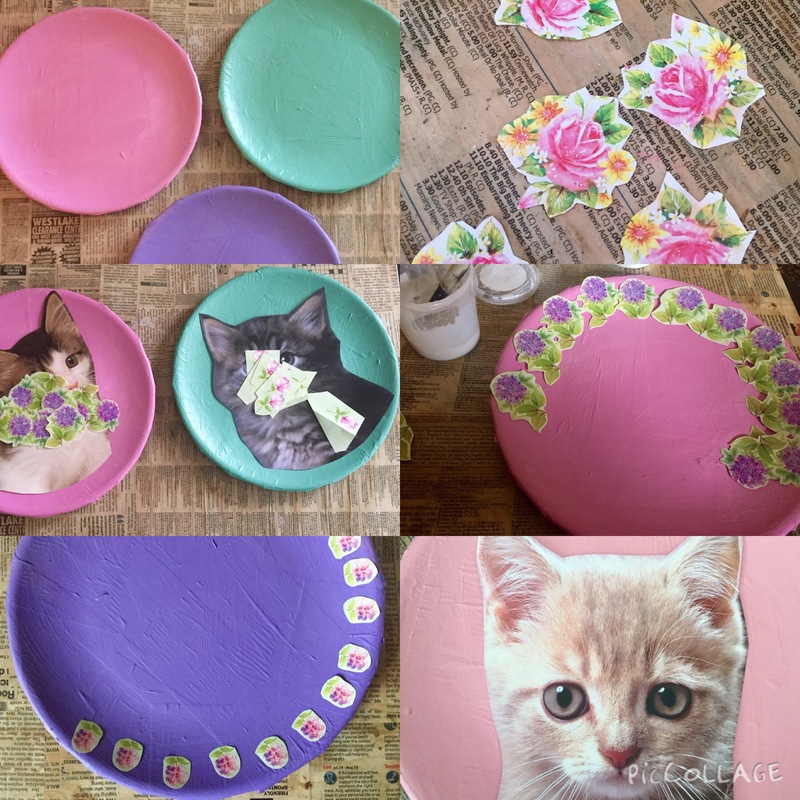 Then when it was dry I painted the plates with pretty pastel shades of acrylics. 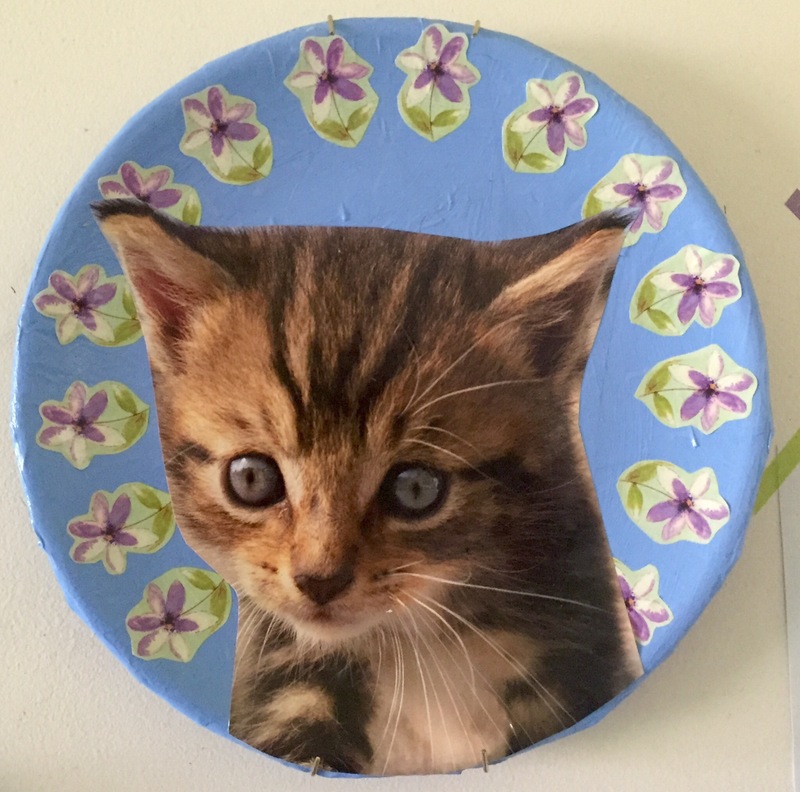 Then I cut out the kittens and flowers and mod podged them to the plates. A quick spray with acrylic gloss, and they were ready to hang on the wall in the laundry! 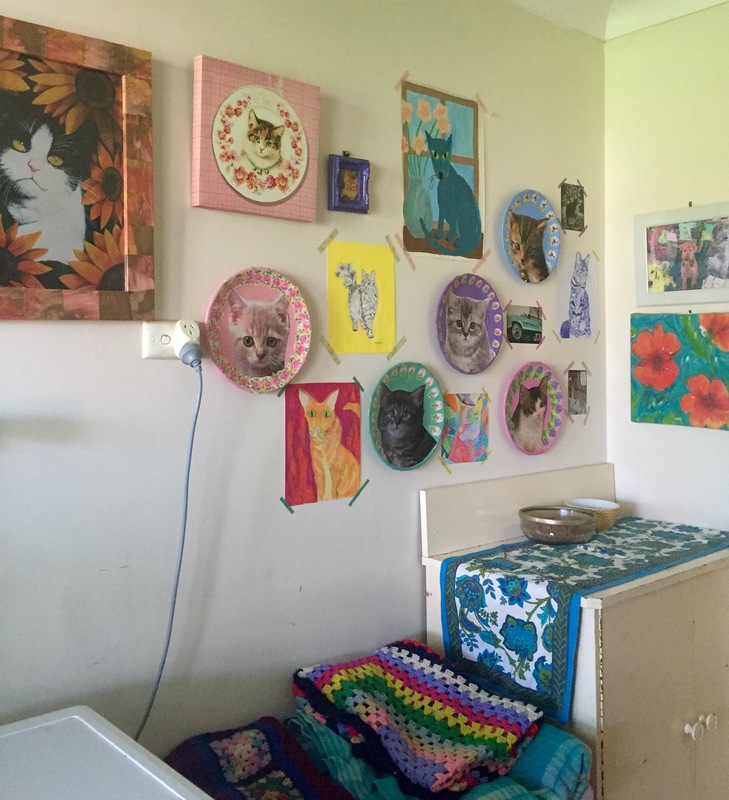 I’m very limited with where I can put hooks in this wall. It backs onto my kitchen and there are a lot of electrical wires running through it, so the spacing was a bit odd. 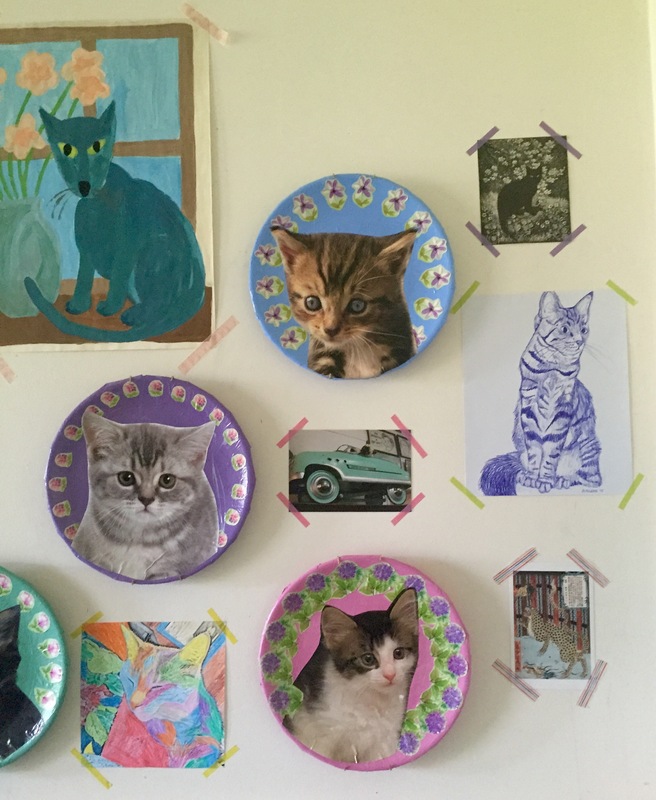 I filled in the spaces with cat pictures and washi tape to try and make a more cohesive collection. I hope the cats appreciate my efforts. 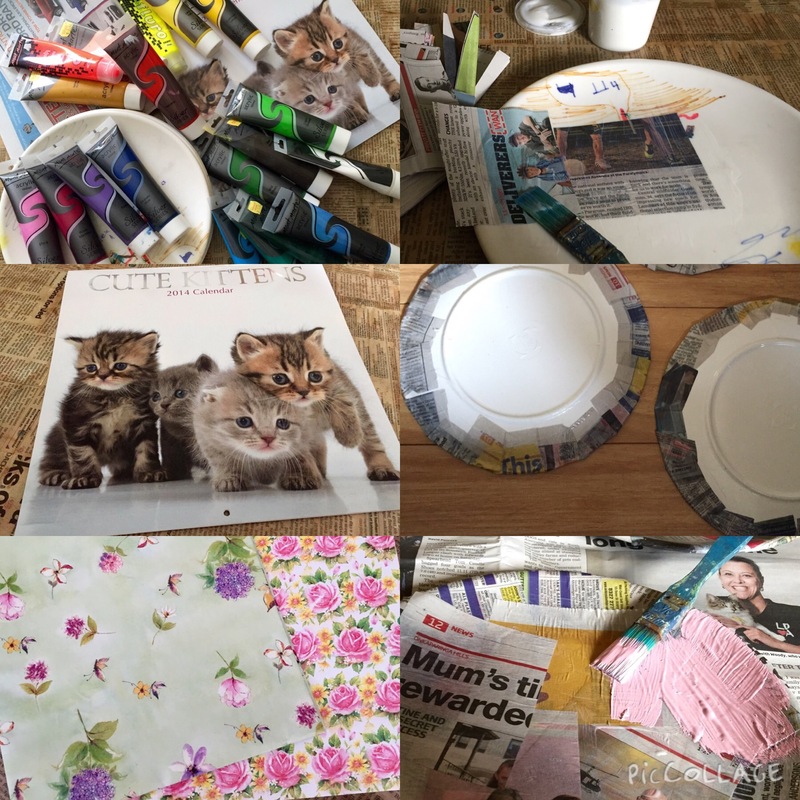 This entry was posted in Craft Projects, Decorating, Home DIY and Decor, Uncategorized, Upcycled Projects, Upcycling and tagged cat, craft, decor, decoupage, diy, Kitsch, kitten, paint, plates, recycle, upcycle, wall. Bookmark the permalink.